On the internet there are many applications and sites that help people to improve the way they work. Notable is an interesting result which is based on giving users an opening to use a feedback program which is created for teams that need to assist in improving many websites’ design, content, and code. 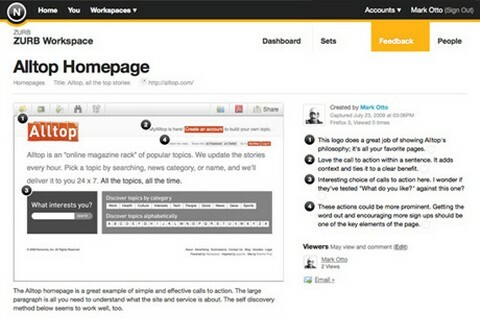 Notable, designed by ZURB, makes sharing web page design and collecting feedback very simple. You can give feedback quickly and easily on design, content and code of a website or application on any page. One of the finest things about this tool is that now it is easy to contribute with any page of a website. You can do it without leaving the browser. Using this product, your team will be able to participate through visual feedback on screenshots. It is a page capture utility. It has got strong annotation features which allow you pinpoint copy, design elements and even code which needs to be tweaked. Notable is the best comprehensive feedback tool on the Web. Notable gives you the chance to express your opinion in a very simple way. It enables you to capture visual, code and copy notes on your browser or even with an iPhone app with the click of a button. You can also upload the capture to your account. You will be able to utilize this solution irrespective of where you are and what computer you are using without any bloated software. The site is simple when it comes to answering the queries you might be having regarding the privacy of your pages or to know about the products you are interested in. All you have to do is install a Firefox extension or you can download the iPhone app. It will take only 10 seconds or less. Permissions can be controlled easily and it is shared only with those you choose. 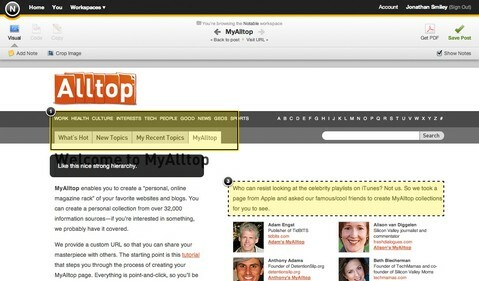 You can take screenshot of a page and then annotate any part of that particular page with comments. For multiple projects you can create separate workspaces and share it with associated teams. There is a plan for Personal use, which is Free. It allows up to 3 users, with 3GB storage. You can have unlimited sets on 1 Private Workspace. And it supports iPhone Application as well.